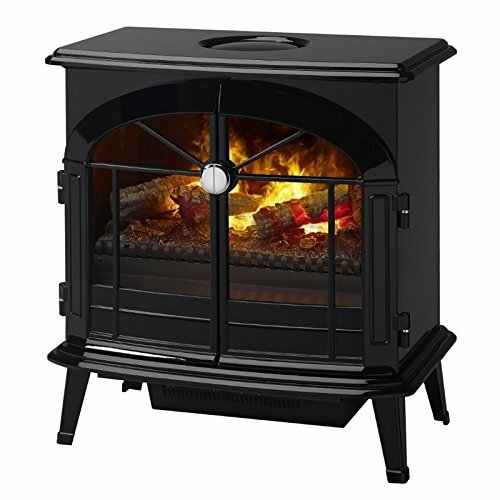 In this review of the Dimplex Celeste Electric Stove Glossy Black the features and benefits of the product will be discussed. The pros and cons of the free standing stove will be looked at from the point of view of the customers that have already purchased the unit. We want you to be an educated consumer before you make a purchase decision. 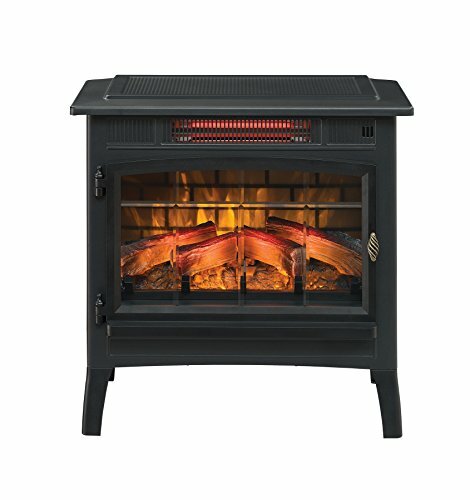 This freestanding electric stove from Dimplex will make any room feel warm and cozy, whether it is in your home or in your office. 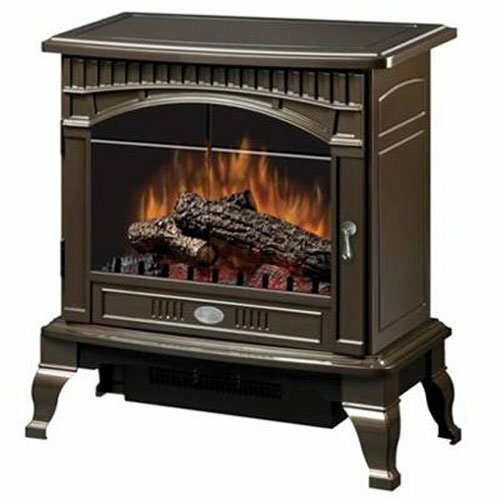 Dimplex is a well known brand name that is synonymous with quality, and this electric fireplace stove does not disappoint. It has a very nice flame effect, and the unit disburses a good amount of heat. The flame effect on the Dimplex Celeste is patented, and provides a realistic flickering flame effect. There is a down light on the logs which provides a very realistic effect by illuminating them from above. There are great looking logs and burning embers at the bottom of the stove to complete the look. The logs and embers cannot be changed. It is also not possible to control the intensity or the brightness of the flame effect. The patented 3D effect of the fire is unique to Dimplex. There is a large viewing area, the largest we’ve seen on a stove of this type. The glass panel is safe to touch at any time. An interior light illuminates everything well. 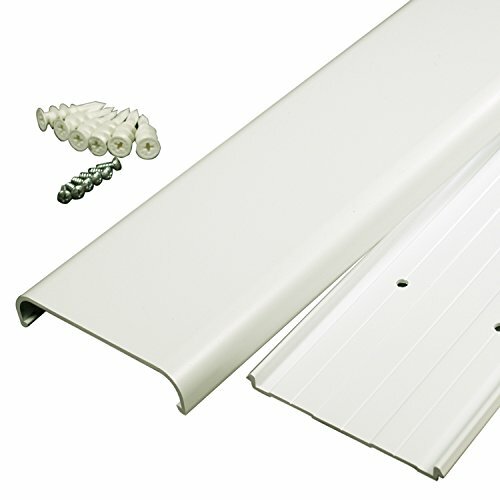 When the flame effect is used it will consume just fewer than 300 watts. The flame effect can be used with or without the heater. When the flame effect is working without heat it can be used for 3 hours. The electric fireplace heater is situated at the bottom of the unit and a fan forces the hot air out. The heater is thermostatically controlled and the temperature can be adjusted. The heater is very quiet and it includes Dimplex’s Purifire™ system, which is designed to filter out particulates and airborne allergens that exist in any room. This will be particularly helpful to people who are sensitive to these allergens. The Dimplex Celeste is designed to warm a room up to 400 square feet. It is estimated that it only costs 9 cents per hour to run the stove with heat. The heater runs on a standard 120 Volt electricity supply, and there is a power cord with a standard plug at the bottom of the heater. The heater will produce 5,120 BTU’s or 1,500 Watts. The thermostat controls the temperature of the room by turning the heater on or off. There is a safety device in the heater which prevents it from overheating, and there is an automatic cut out that will turn the heater off and the heater will not turn on again until this has been reset. There are manual controls for the Dimplex Celeste and the unit is supplied with a remote control. The manual controls are situated at the back of the stove and there are three switches and a thermostat control. There are three LED’s on the front of the stove which indicate which options have been chosen. 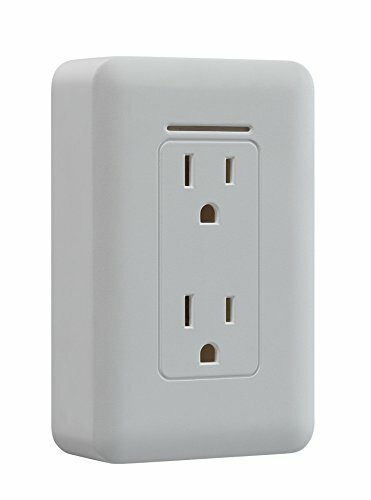 The first switch is the main power on / off switch and this provides the power for all functionality. The second switch allows you to choose between the flame effects only, the flame effects and the Purifire™ system and the flame effects, Purifire™ system and the heater. When the first option is chosen, the first LED will light, with the second option the first and second LED’s will illuminate and the third option lights all three LED’s. The third switch turns the interior light on or off. Below this is the thermostat control. The control needs to be turned fully clockwise to turn on the heat. When the room is warm enough this control can be turned counter clockwise until a click is heard to maintain the temperature. The Dimplex Celeste is supplied with a powerful remote control which will work up to 50 feet away, and it is not necessary to point the remote directly at the stove as the radio frequencies will penetrate walls. The stove is supplied with a remote control and a 12 volt battery which will last around 2600 hours. The remote has two buttons and the “on” button turns on the stove and then if it is pressed again it will go to level 2 which is flame effect and Purifire™, and then if it is pressed once more it will add the heater function. The “off” button will turn the stove off. The thermostat cannot be controlled from the remote. What does that mean? If you use your unit in high heat mode for 2 hours a day for a month it will bump up your electric bill by about $5 per month. In flame effect only mode, same conditions your bill would go up by $2. 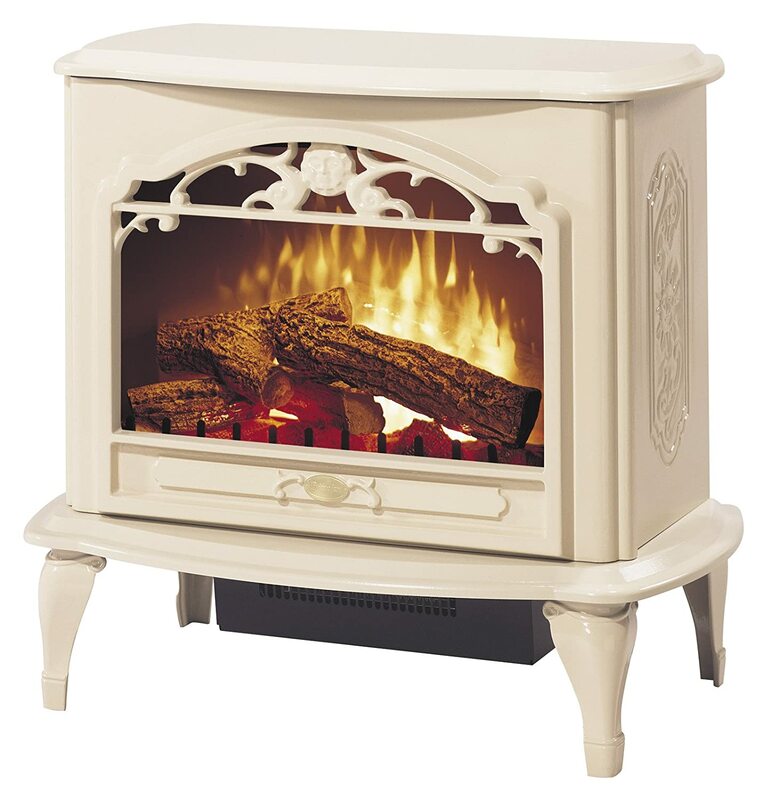 The Dimplex Celeste measures 29.6 inches wide by 17.9 inches deep and 27 inches in height. The stove weighs 78 pounds. There were a number of positive comments about how well the stove was built. It was described by some as being very strong and robust with a heavy metal construction. There were several comments about how good the stove looked. Some said it had a rustic look, and others just described it as “beautiful”. Most said the stove fitted in very well in their homes and offices and the black color was very popular. A lot of people felt that the flame effects and the logs and embers were very realistic. Some said that it looked like a real fire from most angles, and some of the customer’s visitors had commented on how real the fire looked. “It provides a good heat source” – Quite a few customers remarked about the heater being quiet and that the noise it produces is hardly audible. Most of the customers were impressed with the heat output of the Dimplex Celeste. A few said that it heated the room perfectly and made it cozy. The negative comments below were all summarized from real customer reviews. There were a few customers who felt that the Dimplex Celeste did not produce adequate heat. They did not specify the size of the room that the stove was located in. This is certainly a minority view as the majority thought that the heat output was good. The manual controls being located at the back of the stove was a problem for a handful of customers. It was described as “awkward” and “hard to reach”. This again was a minority viewpoint, and most people used the remote control. Check out the different styling cues and statements. 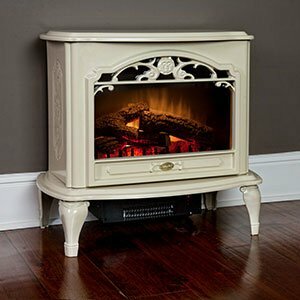 One of these electric fireplace stoves will fit right into the decor of your home. 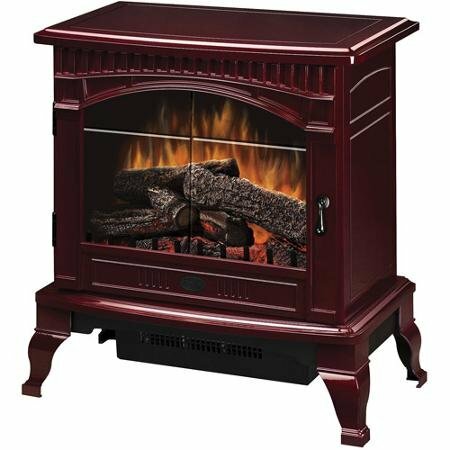 Both are Dimplex Electric Fireplace Stoves at a lower price point. 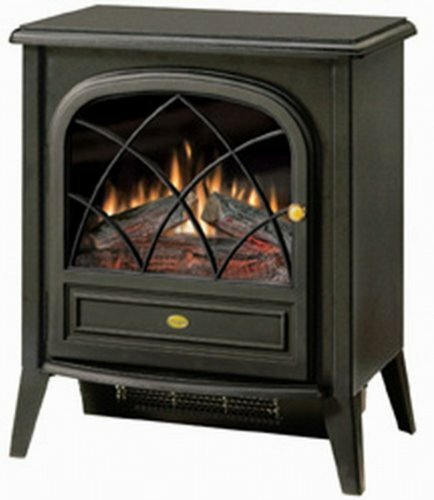 Click here for: full review of the Dimplex 12056A electric fireplace stove. 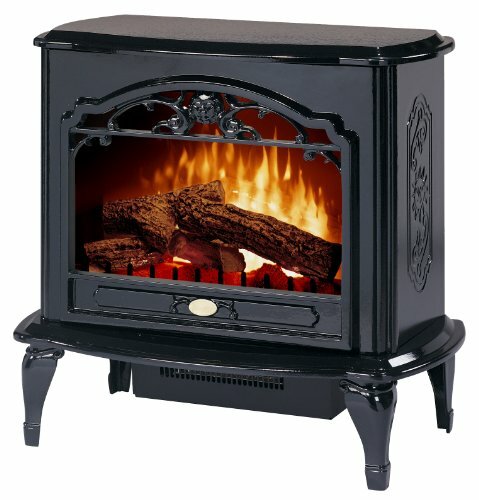 Click here for: full review of the Dimplex CS33116A electric fireplace stove. Update: We have just completed a Dimplex fireplace stove shoot out. 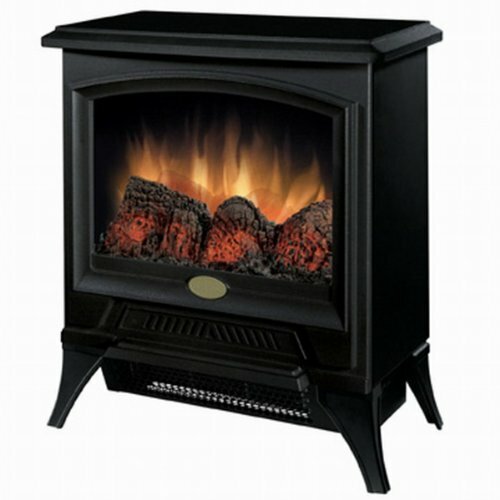 Click here for a Comparison Review of the Top 3 Dimplex Portable Fireplace Stoves. The Dimplex Celeste has been awarded 5 star ratings from 57% of the customers that left a review and 26% of 4 star ratings which is a dominant 83%. The cons mentioned in this review are not considered to be major issues, and should not put you off purchasing this stove. If you are on the fence about whether to buy any electric fireplace check out our post on electric fireplace pros and cons. If you are looking for a well designed and made electric stove fireplaces that will suit any room then the Dimplex Celeste is a good choice. The flame effect is very soothing and has a wonderful calming effect. 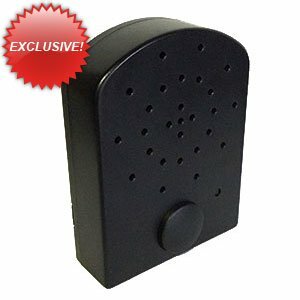 The Purifire™ system is a very nice touch and all these things combined make this a product that we would recommend. We hope you enjoyed our Dimplex Celeste Electric Stove Review – Model TDS8515TB.